News from LMCU: Lake Michigan Mortgage Business Hits $3 Billion! Lake Michigan Mortgage Business Hits $3 Billion! Thank you to our members for helping contribute to our mortgage department’s success! 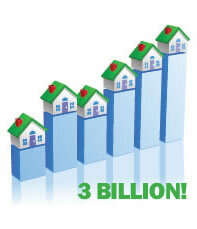 On Monday, November 14, we topped $3 billion in our mortgage servicing portfolio. LMCU now finances over 20,000 homes! Because of this growth, we have been able to create over 85 jobs in the last 2 years! We’re proud to help our members save money and achieve their mortgage goals. We look forward to being able to continue to serve you with our guaranteed low rates and exceptional service.